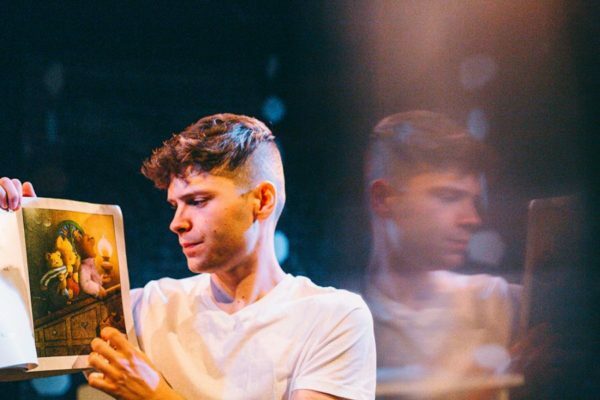 Sensitive, witty and compassionate: Naia Headland-Vanni reviews Documental Theatre’s play about about young fatherhood. Pulling Out at the Wardrobe Theatre, Bristol. Documental Theatre create texts from genuine human experiences, exploring what lies at the heart of their circumstances. In doing so, they give a voice to those often overlooked; encouraging those with a tendency to discriminate to think again. Pulling Out is a sensitive, witty and compassionate portrayal of the difficulties of young parenthood, based around “candid conversations” with teenage dads to craft its text and narrative. Leo (Bob Yates-Tily) is seventeen. He accepts his fatherhood readily and dotes upon his son. However his girlfriend Caitlin (Jenny Davies), needs more from him. She is utterly exhausted and desperate for them to raise the child independently, yet Leo can’t help but disappoint. His shortcomings as a father are not through lack of devotion, his love for their son is abundant. But rather, through a deep sense of inadequacy. The acts that he resorts to in order to provide for his family are the ones that alienate him from them the most. Lucy Bell’s text is dramatically active throughout. It’s fast paced, emotive and tender. The dialogue is consistently engaging, making the audience’s ability to understand the perspectives of these characters feel effortless. Stephanie Kempson’s direction brings out the vulnerability, tensions and inner-conflict of the actors brilliantly. Jenny Davies plays the varied characters in Leo’s life with great versatility. She shifts between his teenage girlfriend, mother, drug dealing mate and case worker seamlessly, aided by the fluidity of Joel Daniel’s (Movement Director) scene transitions. Bob Yates-Tily brings a range of qualities to the character of Leo. He is simultaneously ‘lad’ and doting father – reckless, conscientious and utterly conflicted. Pulling Out is a remarkable representation of the realities of young parenthood that is tackled with heart, sensitivity and humour from its cast of two. As spectators, we are provided with a new perspective and – almost without realising it – made to care more. After their run at the Wardrobe Theatre the piece will be performed at Young Offenders Centres. With its lack of condescension or preaching, this feels like an ideal match of play and performance space. Pulling Out is on at the Wardrobe Theatre in Bristol until 11th March 2017. Click here for more details.